This is an architect’s rendering of the common area of the Chinese Mandarin Language Immersion School under construction in the Galleria area. This is an architect’s rendering of the common area of the Chinese Mandarin Language Immersion School under construction in the Galleria area. Construction is under way of Houston Independent School District’s new campus to accommodate its Mandarin Chinese Language Immersion Magnet School, currently housed in Gordon Elementary School in Bellaire. The design of the $32.2 million campus focuses on the Chinese character Ming, a sun and moon concept in which bright colored learning and academic areas will be located in the sun wing, representing energy, while community spaces will be in the moon wing for a more subtle and reflective area. Designed by PBK Architects, the 118,000-square-foot facility, at 5440 W. Alabama, will be built to utilize 21st century learning technology for regular and language immersion learning. 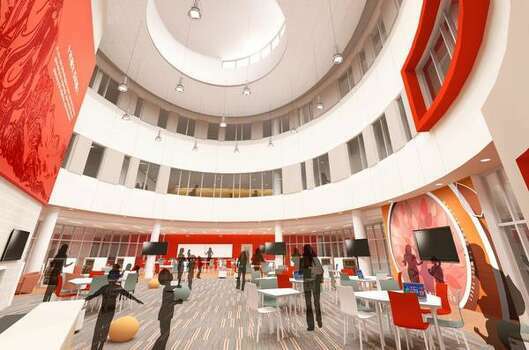 It will feature flexible learning spaces, where classrooms can be combined for larger groups, a light-filled learning and technology commons in the three-story sun wing, a technology and design lab for robotics and 3-D printing and a top-notch audio system so students can clearly hear tones and language. The new campus also features a gym, cafeteria and auditorium with a stage for performances. ← Charter Mandarin immersion school looking to start in San Jose, Calif.